Join us at the 1st Annual(?) 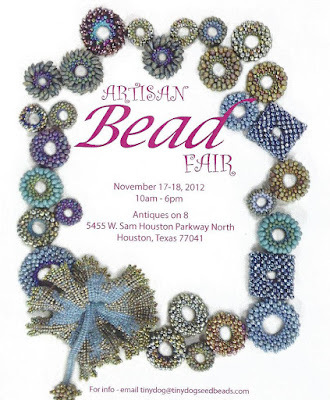 Artisan Bead Fair. The Bead Fair consists of a group of approximately 15 bead artists getting together, displaying and selling their creations. There will probably a few components available. I’ll be bringing my bead mixes along with my bead and metal creations. This will be kind of a change of pace for me. I’m looking forward to it. Oh, and check out the venue. It is being held at the Antiques on 8 mall. So you have the opportunity to see some antiques on the way back to the Bead Fair. It is a very interesting place and should be a fun time. P.S. There is a small lunch area at the mall for you to take a break and relax. Reposted on Contemporary Handweavers of Houston website at http://weavehouston.org.